This week, Science for the People is talking about weapons: both the ones that evolve in nature, and those created by humanity. 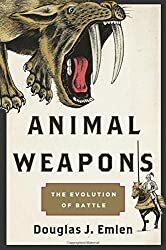 We’ll talk about the arms races that spur the development of horns and claws, warships and nuclear weapons, with Doug Emlen, Professor in the Division of Biological Sciences at the University of Montana, and author of Animal Weapons: The Evolution of Battle. This entry was posted in Curiosities of Nature and tagged Animal Weapons, Doug Emlen, evolution, Henry Holt, Podcast, science for the people, University of Montana, warfare, weapons. Bookmark the permalink.